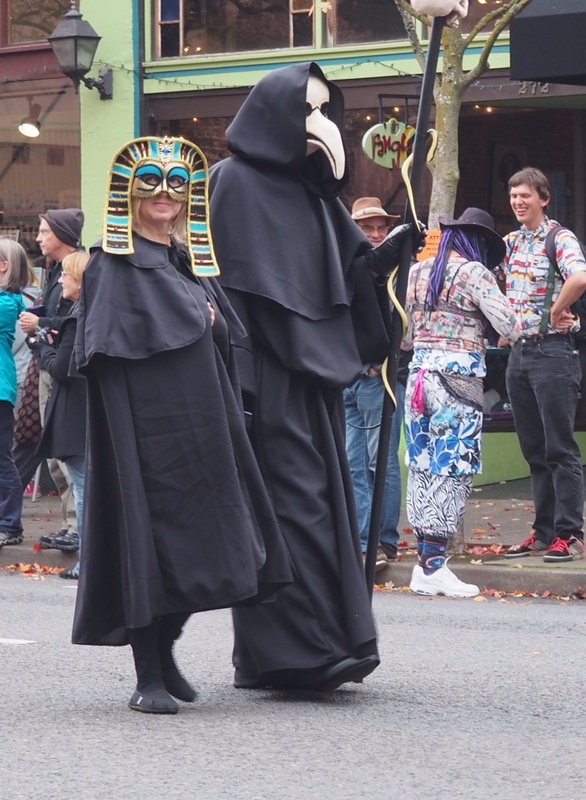 Ashland is a community of striking contrasts, geographically and especially demographically, as these first two photos so perfectly illustrate. The great thing about Ashland is that more often than not, it works! 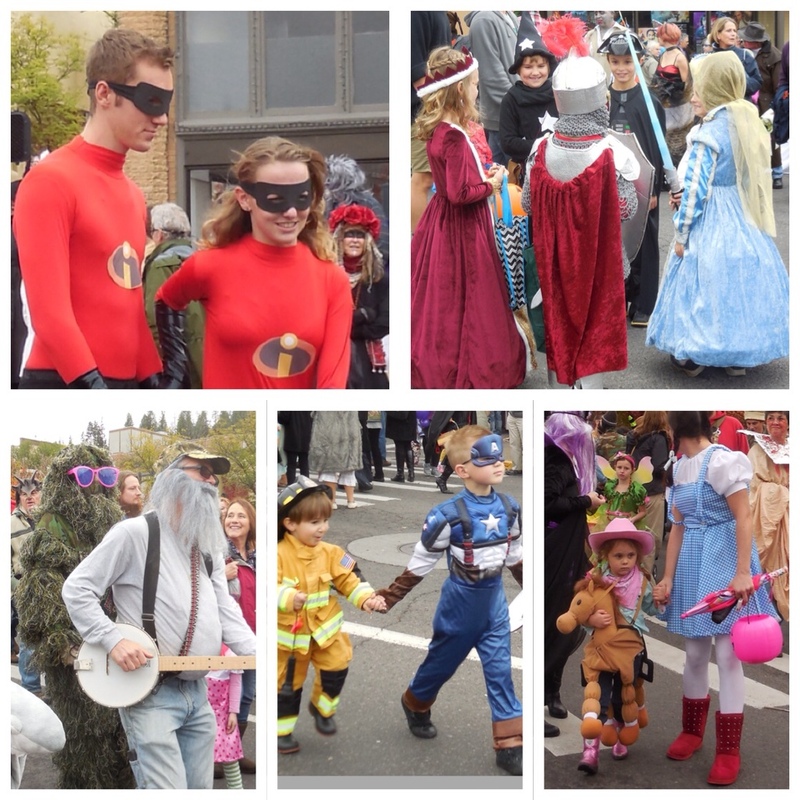 This community really knows how to come together for a holiday parade (we love our parades) and Halloween is no exception. I hope you have as much fun as we did! 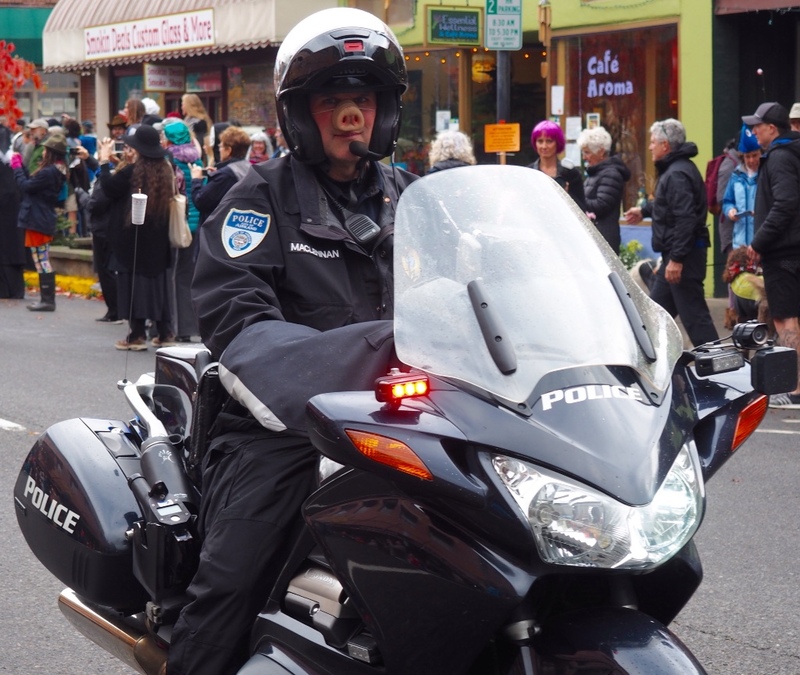 This officer not only had a sense of humor, but he also had the honor of leading the Halloween Parade. 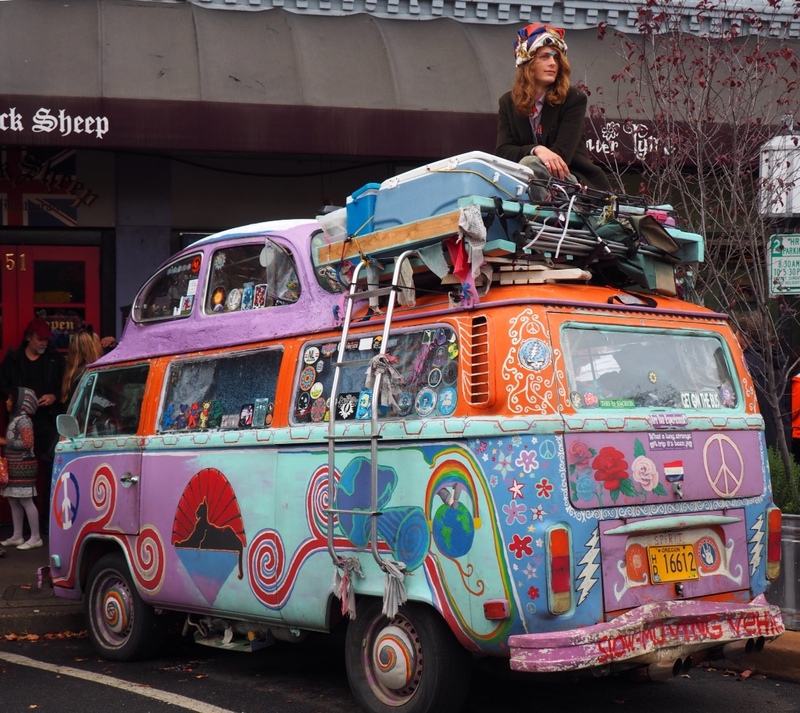 This young man perched atop his van, surveying the crowds as if he were Lord of the Lands. The only political statement I saw. Crowds gather at the square. 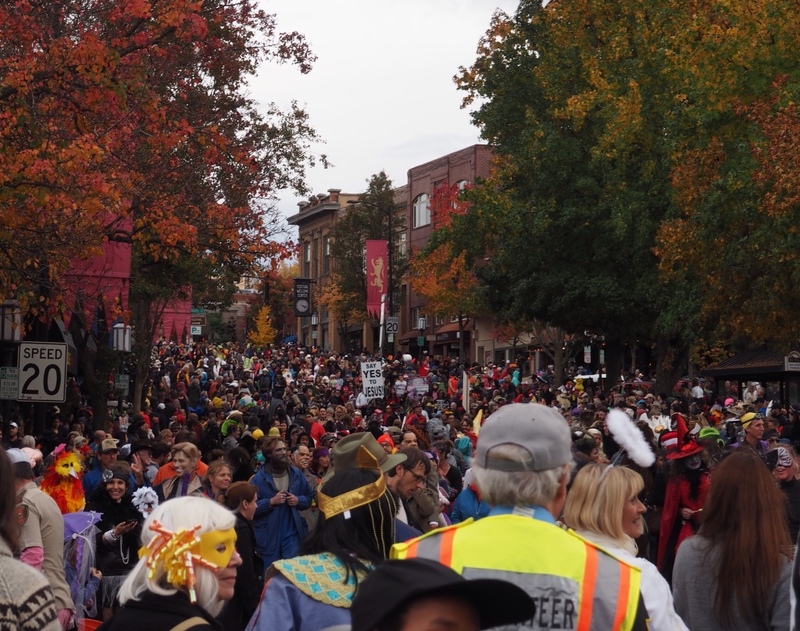 Crowds fill the street too. Another parade!? 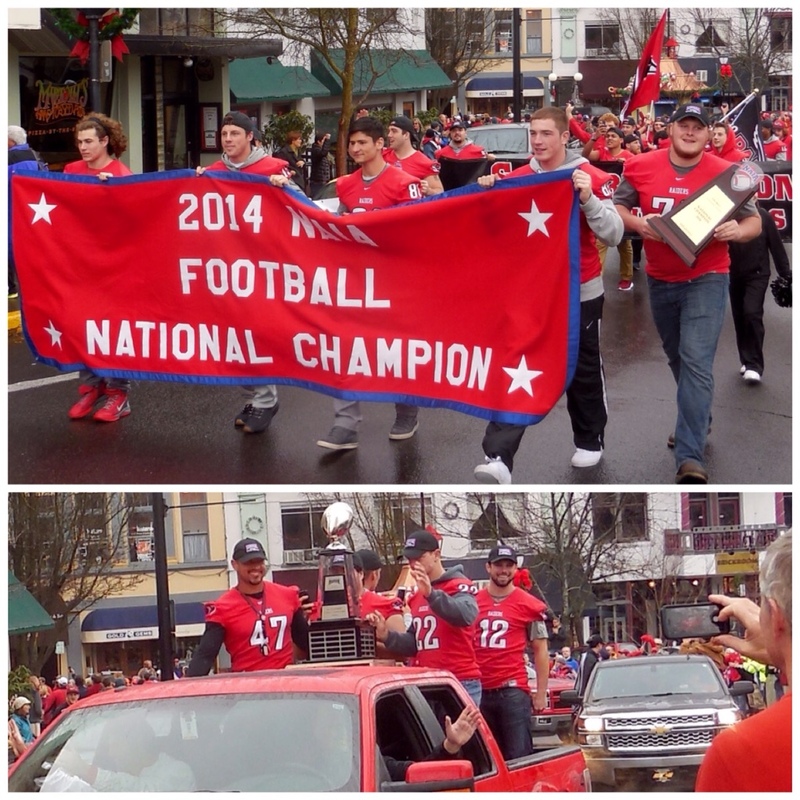 Ashland's Southern Oregon University Raiders returned from Florida, where they won their first NAIA football championship Friday, so the locals rolled out the red carpet downtown on Sunday. The Raiders defeated Marian of Indiana Friday 55-31 in Daytona Beach. The college football world awaits as the Oregon Ducks try to bring another football title to the state. Our daughter-in-law Leah and our son Andrew came down from Portland, Oregon. 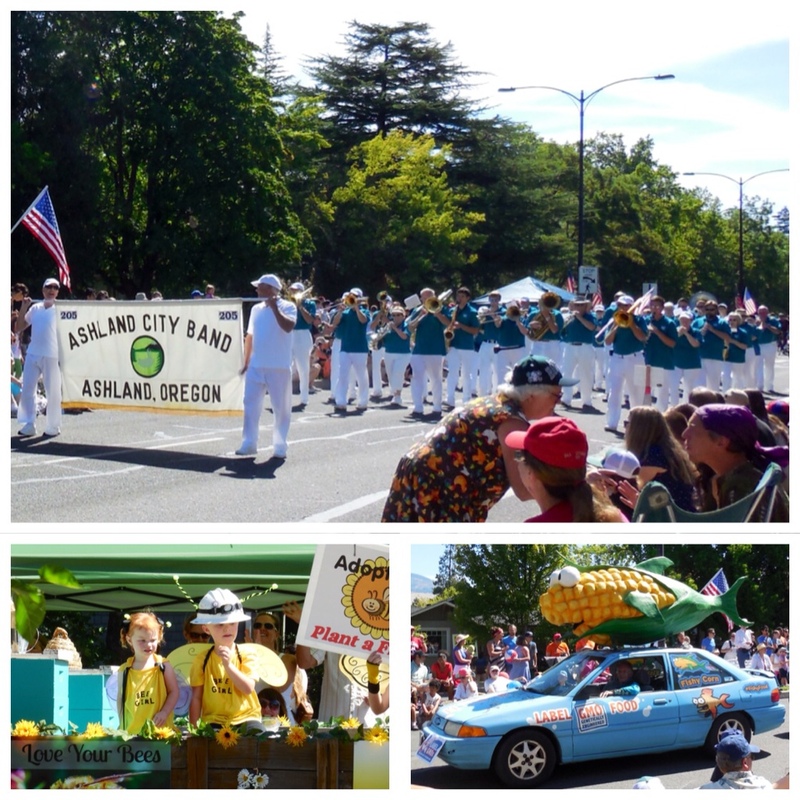 Ashland really loves its parades and the community was out in full force this afternoon. We scouted out a spot to enjoy the festivities, but soon found ourselves on our feet, not wanting to miss a thing. 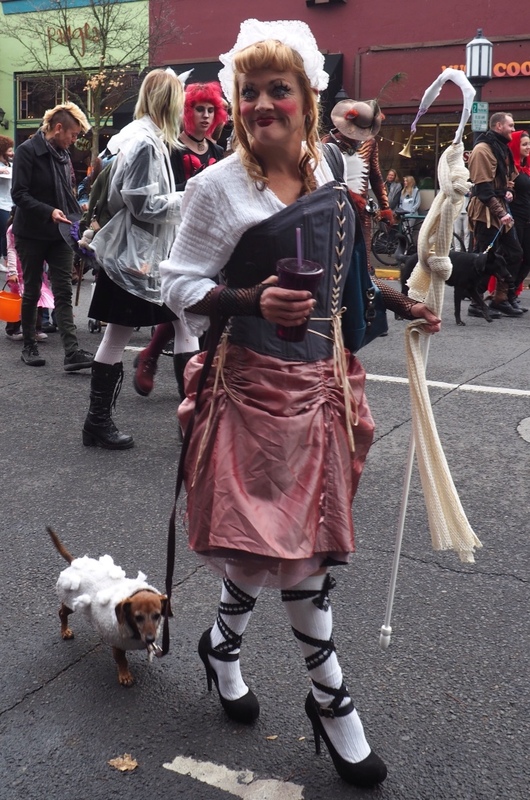 We were amazed by the number of costumed people of all ages marching in the Halloween parade. 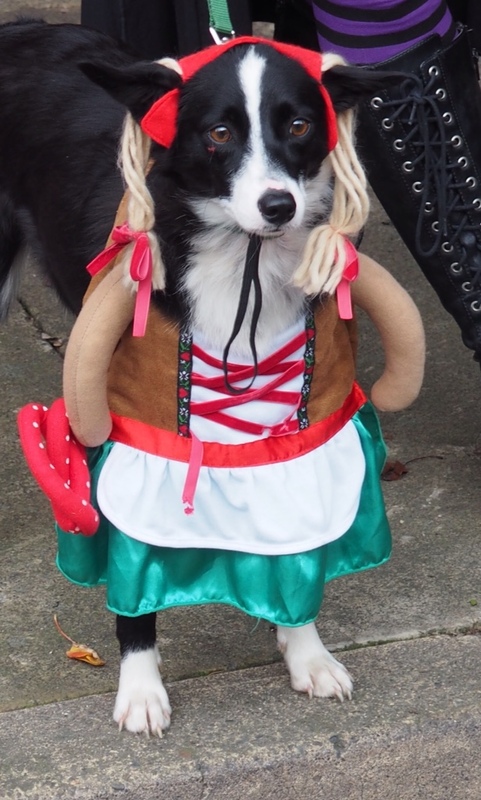 The costumes kept on coming. 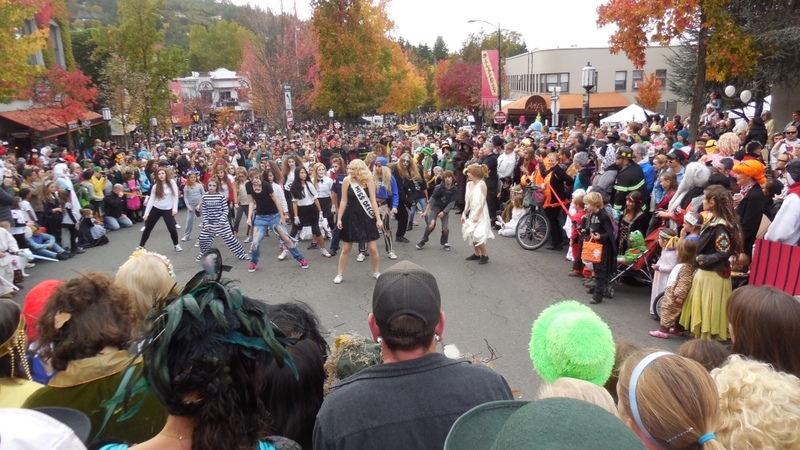 Flash mobs sprang up around town, entertaining the crowds. Now that our home renovation project is complete, we took advantage of this beautiful fall morning to wander downtown…now only a ten minute walk! The local paper promised a lot of activity, and we wanted to enjoy the last bit of sunshine before the forecasted rain arrives. 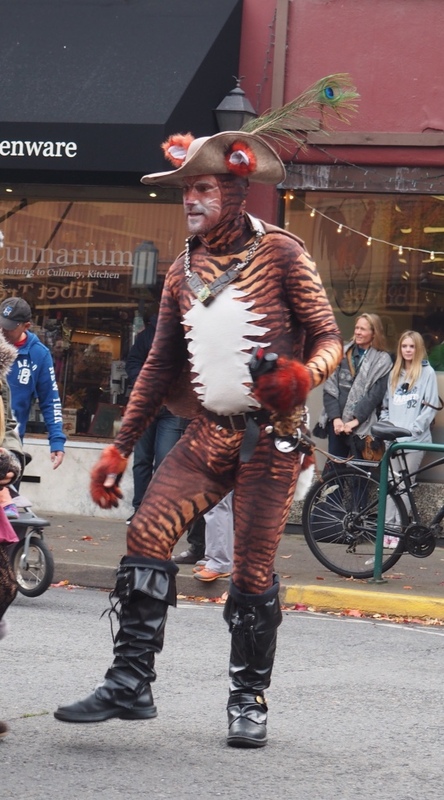 In true Ashland style, the day provided something for everyone. To fortify ourselves we indulged in a delicious cinnamon roll, irresistibly displayed at the Saturday Market. 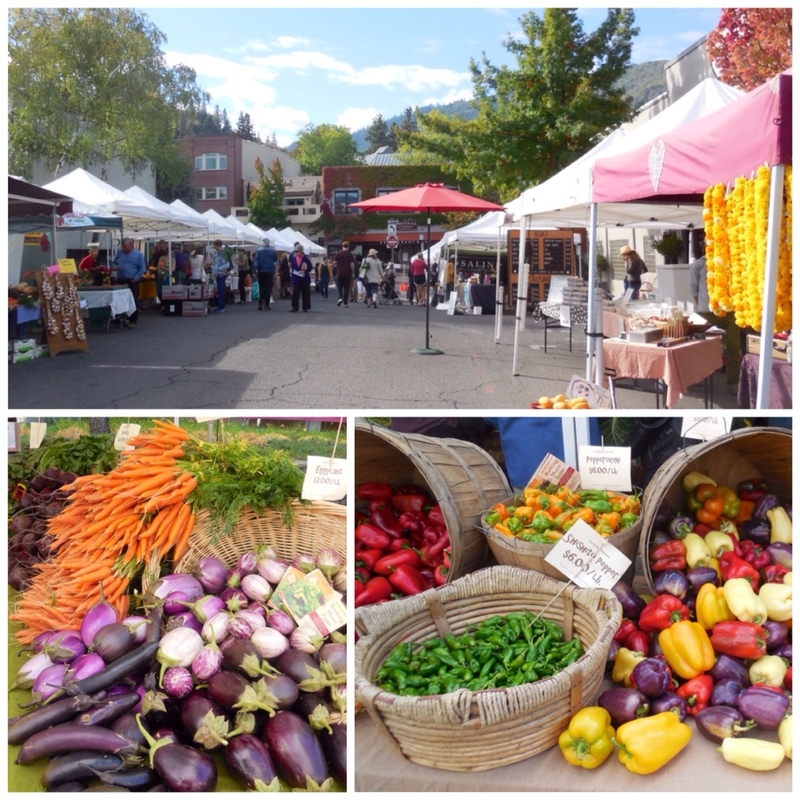 Ashland's Saturday Market offers a harvest of local produce, flowers, food, crafts and more. Rainbows of every size and shape were proudly displayed. 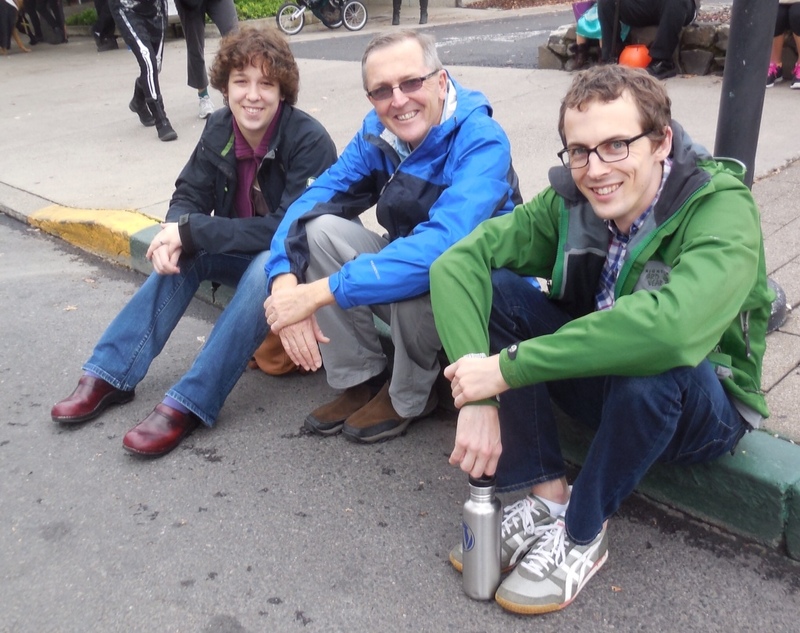 We're learning that Ashland loves its parades. 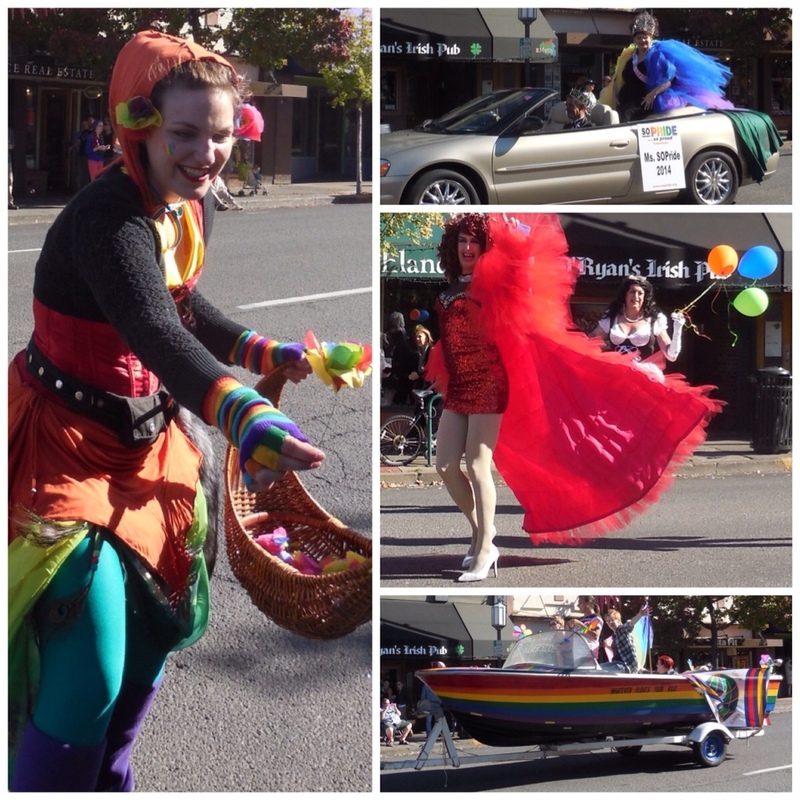 The fifth annual Southern Oregon Pride Festival hosted a parade through downtown this morning. A rollicking display of colorful entries with spirited participants filled the streets, waving and shouting to a cheering crowd. Everyone enjoyed the creative pageantry on display. 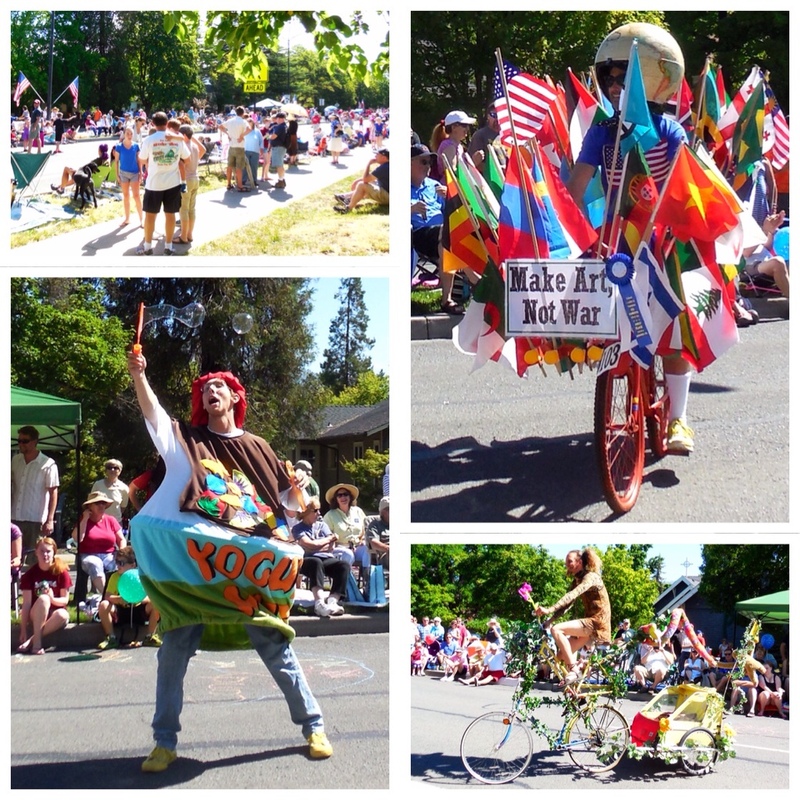 We followed the parade to Lithia Park where more Pride events were planned. We continued beyond the festivities, enjoying the changing season as fall color took over. 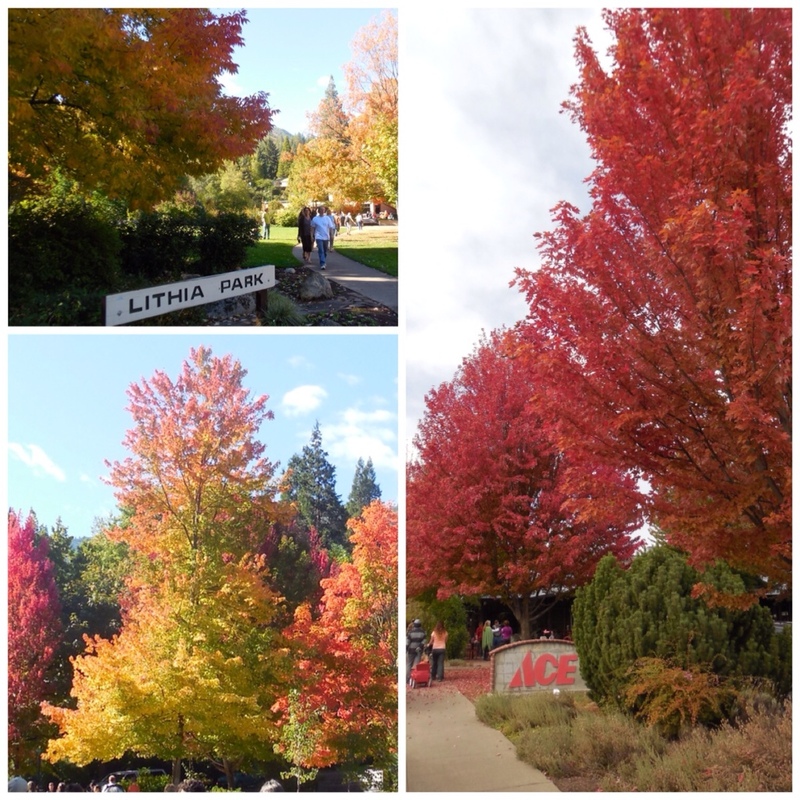 Mother Nature put on her own show today in Lithia Park and beyond. To enjoy an all-American slice of life, what could be better than a good old fashioned parade? Well…maybe apple pie, but I'm sure Ashland offered a slice of that today too. The annual July 4th celebration kicked off at 10:15 this morning with a parade marching down East Main Street and into the heart of the city. We were told up to 14,000 out-of-town visitors were expected to attend the festivities today. 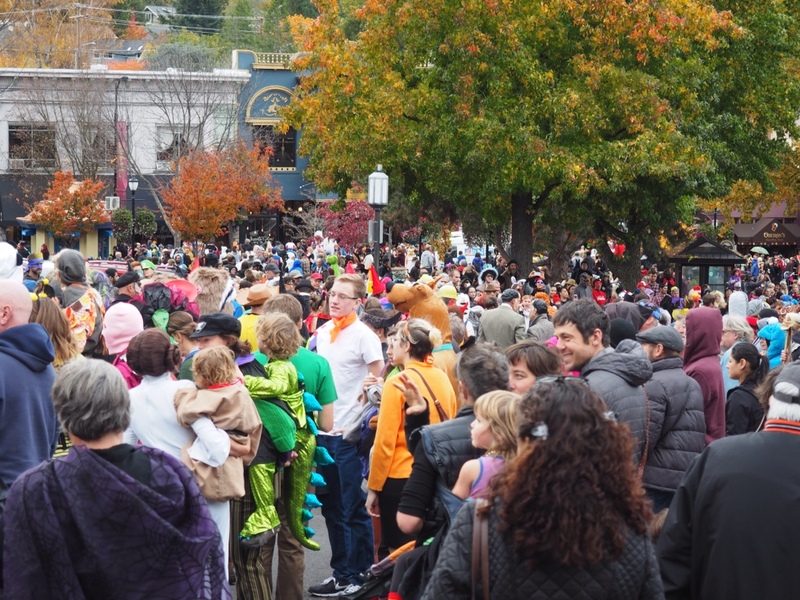 Crowds lined the street of the mile+ parade route. Some participants had something to say, while others simply tapped into their inner-child. Locals started planning yesterday when blankets and tape began to appear on the downtown sidewalks. We'd been warned that if we wanted a curbside seat, we'd need to mark our territory. Maybe next year…today, we found a spot in the shade and stood with all the other latecomers. 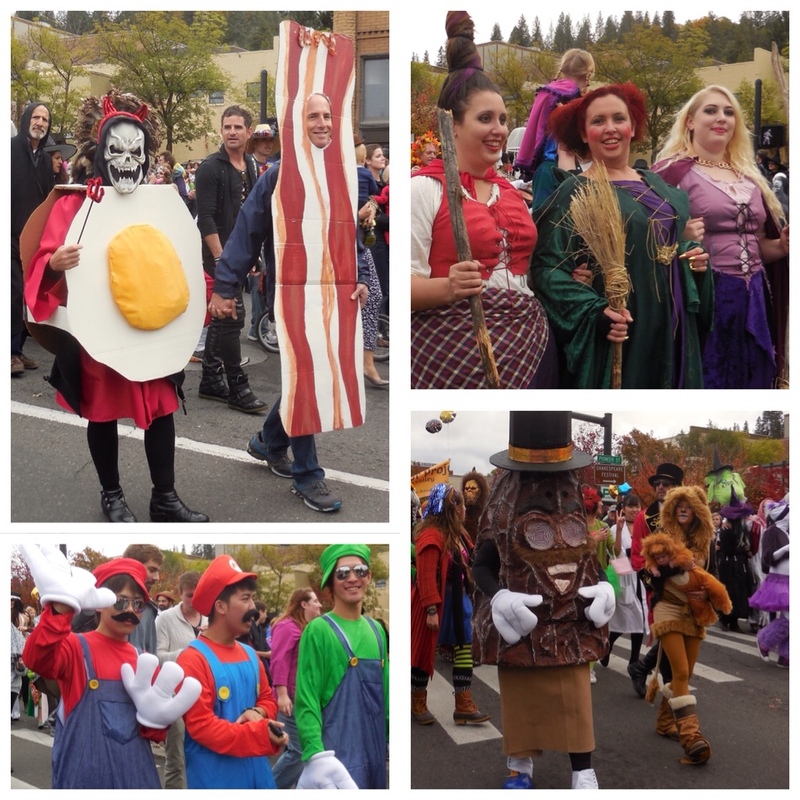 The parade was a mixture of traditional and contemporary, young and old, silly and serious...and a good time was had by all! The Ashland City Band set the mood with a selection of patriotic marches. We learned that their oldest member (a tuba player) is 97 years old. Unfortunately, he had to give up marching four years ago, but he still plays at the weekly Thursday night concerts in Lithia Park.